It seems like my local stores have gone the entire year with no additions to their Star Wars stock. In general this is fine, as I'm not a serious SW collector any longer, but it's still sort of strange to see the apparent total apathy towards the line on both the part of the consumer and the department manager. Maybe the end is finally in sight for this bellweather brand? 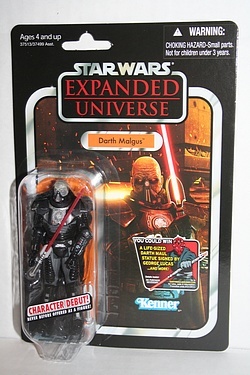 Well, in spite of all that, a new wave of Vintage Collection figures finally showed up, and included a pretty tough looking hombre in the form of Darth Malgus, VC96. I simply couldn't resist picking one up! Click through for a few more images of this relatively new (at least to my part of the world) figure from the apparently hard to find 2012 Star Wars line!